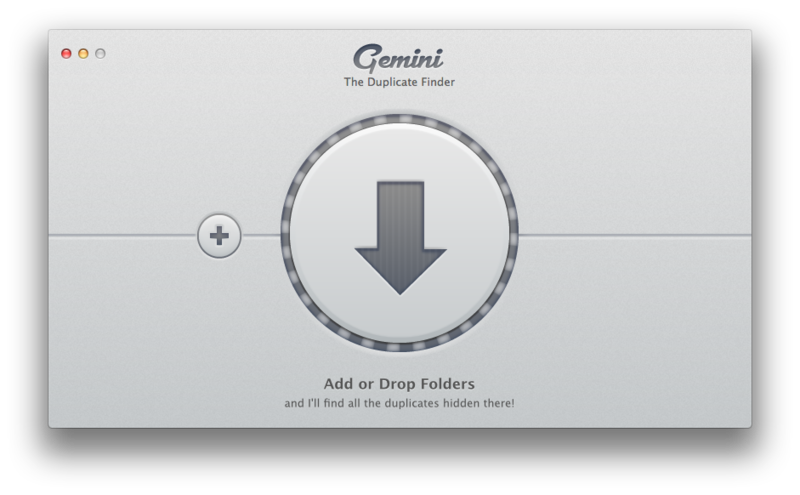 You tell Gemini which folder to search for duplicates in by dropping it on the application window. Every time I use my camera, I face the same painful struggle for hard drive space. 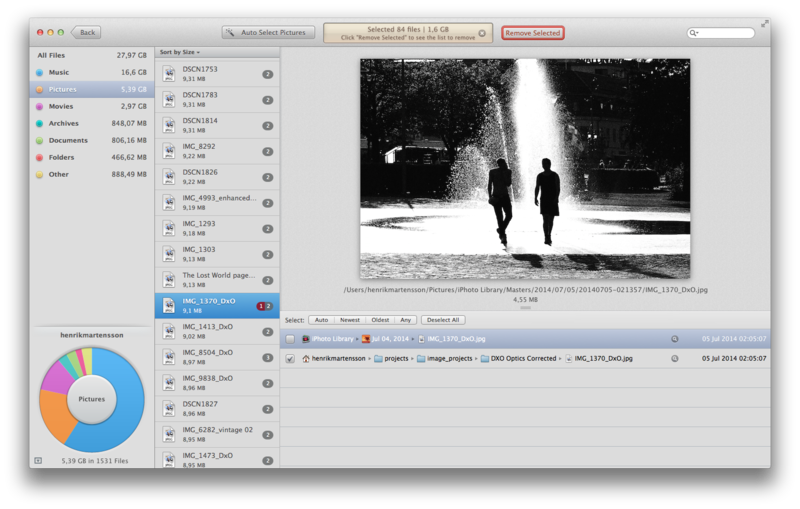 RAW files are large, Pixelmator files even larger. In addition, the same file often gets duplicated. For example, I may import a RAW file into Aperture, then process it using DXO Optics Pro, import the DXO version into Pixelmator, save a Pixelmator file, export a JPG file, and then import the JPG file into Aperture. Finally, I may export the Aperture version to a cloud service so that someone else can download it. That leaves me with a lot of different versions of the original, but also with several exact duplicate files. This morning I had enough, and bought Gemini, an app that locates and removes duplicates from my Mac. Using Gemini is easy: You drag and drop the folder you want searched for duplicates onto the application window, and click a start button. I dropped my home folder on Gemini. I could have dropped the harddrive icon, but I did not want to take any chances with Gemini eliminating system files. Gemini is supposed to be smart enough to avoid that, but why take chances? Scanning the harddrive takes a couple of minutes. Gemini is fairly fast compared to other apps I have used. Gemini found 27.97 GB of duplicate files. I have seen older reviews that complained about Gemini missing duplicates, but this problem seems to have been solved. When Gemini has analyzed the harddrive contents, a new window pops up. I do like the interface. Files are broken down into major categories. Within each category, files that have duplicates are listed. The list is ordered by size, you you can gain a lot of space by eliminating duplicates in the first ten to fifteen items. Gemini has an Autoselect feature that automatically selects duplicates. This is fast, but a little bit risky. 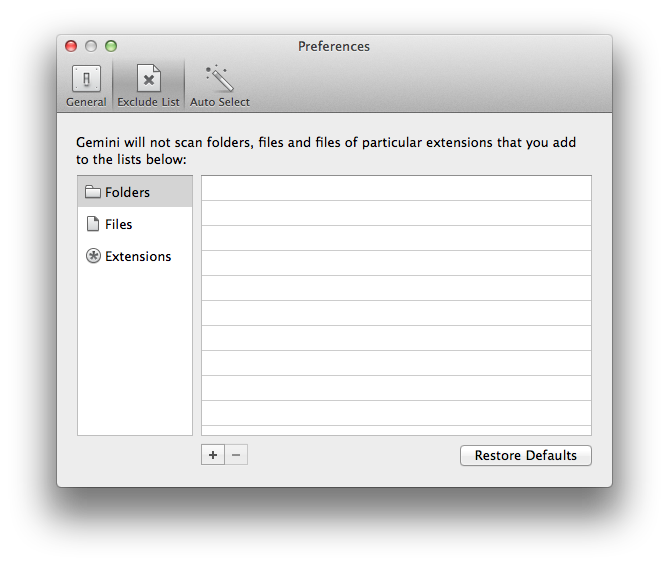 You and Gemini may not agree which version of a file to keep. I selected files manually. A bit slower, but it felt a lot safer. 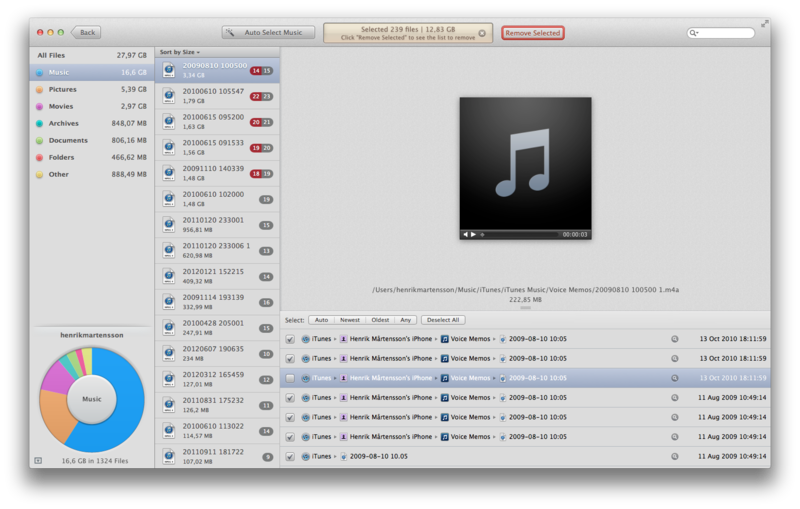 The worst space wasters on my harddrive were not photos, but audio files. Many of these had been duplicated fifteen times or more. When I told Gemini to remove the files I had found, it showed me a list of files to be removed. 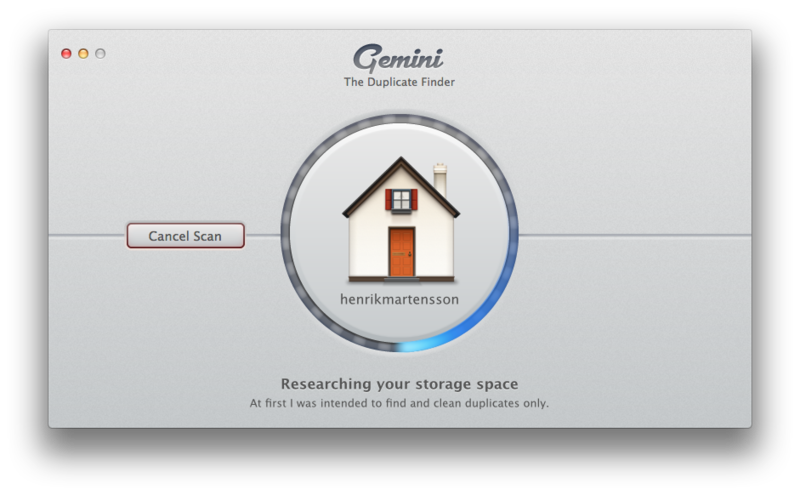 Gemini can remove duplicates in iPhoto and Aperture libraries too. 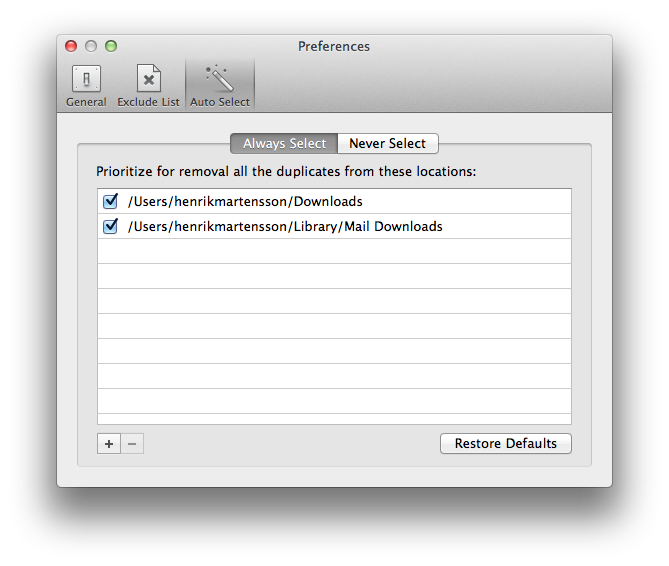 To ensure the integrity of the photo libraries, Gemini launches iPhoto or Aperture to delete duplicates. When Gemini deletes files, they are moved to the Trash bin. They won't be deleted from the harddrive until you empty the Trash. That means you have one last chance to change your mind, even after Gemini has done its work. Even though Gemini found 27 GB of duplicate files the first time around, I removed about 15 GB. I was a bit pressed for time. I'll have another go in about a week. Those 15 GB makes a lot of difference though. My computer feels a lot more responsive, almost back to its usual self. Another round with Gemini, and moving some old, large files to external storage, should get my computer back to full speed even when multitasking several large apps, and working with very large files. 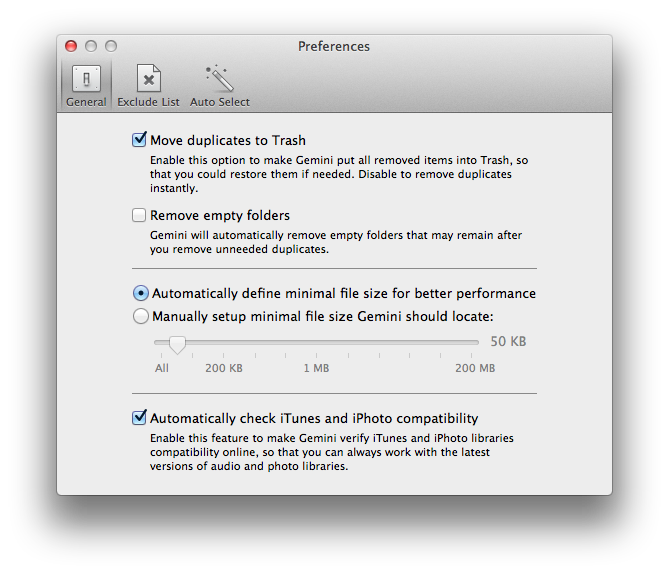 Gemini has some useful but easy to miss features hidden in its Preferences dialog. 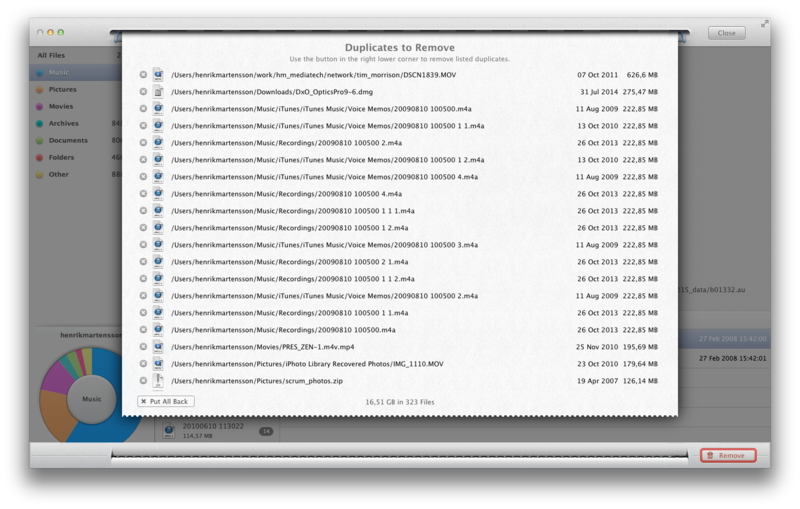 for starters, you can define the minimum size of files to remove. This can speed the analysis up by reducing the number of files Gemini has to check. It is also useful to be able to exclude files you do not want checked. You can exclude files based on which folders they are located in, the file names, or the file extensions. Finally, you have some control over Gemini's Autoselect feature. You can tell Gemini which folders to prioritize, and which folders to exclude from Autoselect. Overall, I was impressed with Gemini. The app does its job, the user interface is well thought out, and it is reasonably fast.